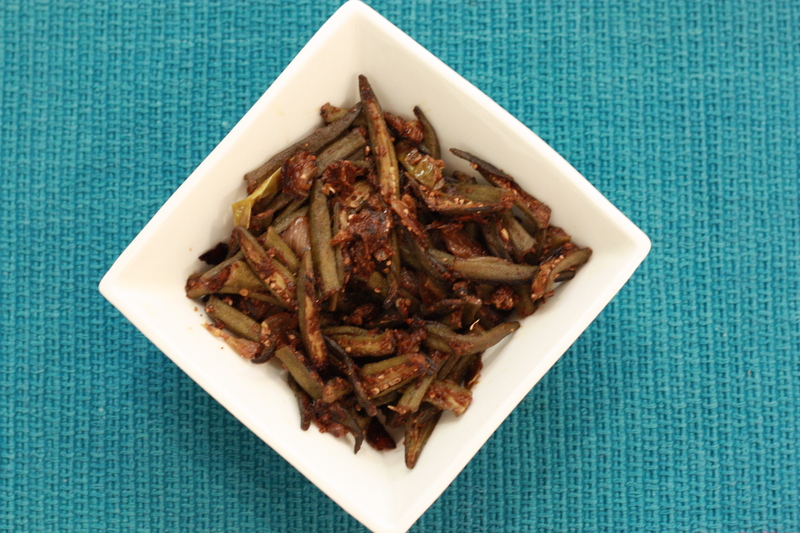 As a kid, Bhindi (ladies fingers; okra) was my favourite. While now my palette has increased beyond potato and okra; whenever I go home I can be sure that one of the dishes on the menu would be bhindi, just for me :). This recipe for Achaari Masala bhindi is my favourite when I want to do something special, really quick. As a short cut I use the spice mix from my favourite spicy mango pickle jar. Wash bhindi under running water. Pat them dry with a kitchen towel. Cut off the head and tail and slice into half along the length. Note: If you leave the okra wet, it will become very slimy and not cook properly. Once the oil starts to smoke, add asafoetida, green chillies and chopped okra. Sauté for a couple of minutes and then add onions. Add all the spices (except chaat masala) and the achaar masala. Mix well to coat all the vegetables in the spice. Cook covered on very low flame for 7-10 minutes until the bhindi is soft and doesn’t stick to each other, keep stirring in between so that it doesn’t stick to the pan. Remove from heat, sprinkle a little chaat masala and serve with hot rotis. Health Benefits of Okra: Okra is high in both soluble and insoluble fibres that help to reduce cholesterol, prevent diabetes and constipation. Okra is also a rich source of many nutrients such as vitamins A, B6, C, iron and calcium.